Photogrammetry is a technique for making 3D models from photographs. Originating in the sciences, it has been around as long as modern photography. In general terms, it is the science of making measurements from photographs. Archaeologists have begun using this technique in recent years to digitally record finds and entire sites. There is a triangulation aspect of photogrammetry that can be translated to create 3D models. Within this contemporary context of scholarly and archaeological research, photogrammetry is a term describing the process of making 3D models from photographs. It requires a series of photographs of the object from different angles with some overlap. A photogrammetry program can then use the photographs to reconstruct its geometry – thus creating a 3D model. Photogrammetry also has many academic applications including analyzing, measuring, reconstructing, recording, transferring data, and more. Photogrammetry is not limited to single objects. It can be used to recreate entire terrains, buildings, walls — there are many possibilities. Below are the primary documentation scenarios that one would run into and how to go about capturing them. For the facade of a building, one should take photographs as he or she walks parallel to the wall. In interior spaces, one should walk in an even circle around the room with his or her back to the wall. Capturing an isolated object, is the technique I will be using in this independent study. Walk around the object (or spin it on a turntable) and evenly capture all sides of the object. I would also suggest carefully following the photography guidelines below. Walk around your object in an even circle, or place your object on a turntable with a stationary camera. 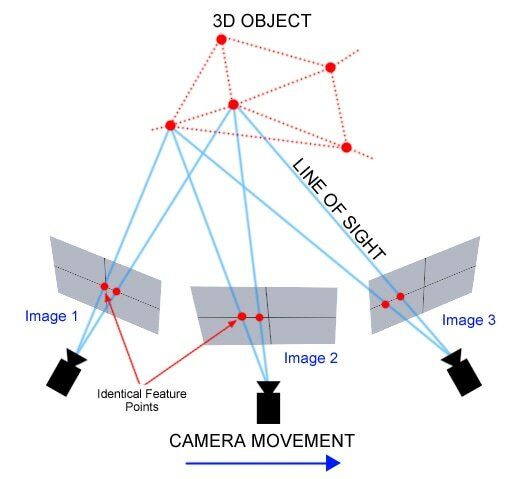 Capture photographs of your object straight on, slightly above, and slightly below. This allows you to capture unusual shapes and a more thorough texture. Good photographs lead to a good model. This being said, be mindful of your depth of field as you do not want any part of your object to be blurry. It is a good idea to have your camera set up on a tripod so that you can decrease the shutter speed and increase depth of field. It is difficult to create a model of an object with a reflective surface. Avoid highly metallic objects and clear objects like glass. There should be a 60% to 80% overlap between each of your pictures. This allows the program to compile your photographs more easily and read them to recreate your object’s geometry.